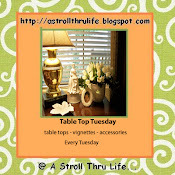 I am featuring some "favorite things" displayed in my living room this month, leading up to the reveal. 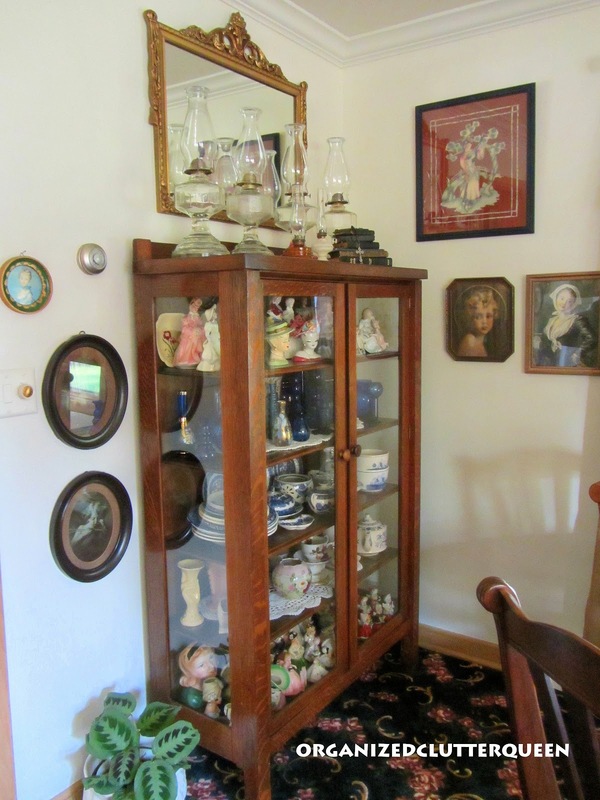 No favorites list would be complete without Grandma's china cabinet. I think my Grandma referred to it as a "china cupboard" but it's kind of a combination curio/china cabinet with glass on three sides. On top of the cabinet, I display my "stack of miniature Bibles", mostly old and some in foreign languages. Part of my oil lamp collection is also here with a very special antique mirror given to me by my Mom. It hung in my childhood home. Many of my collections or parts of collections are here. 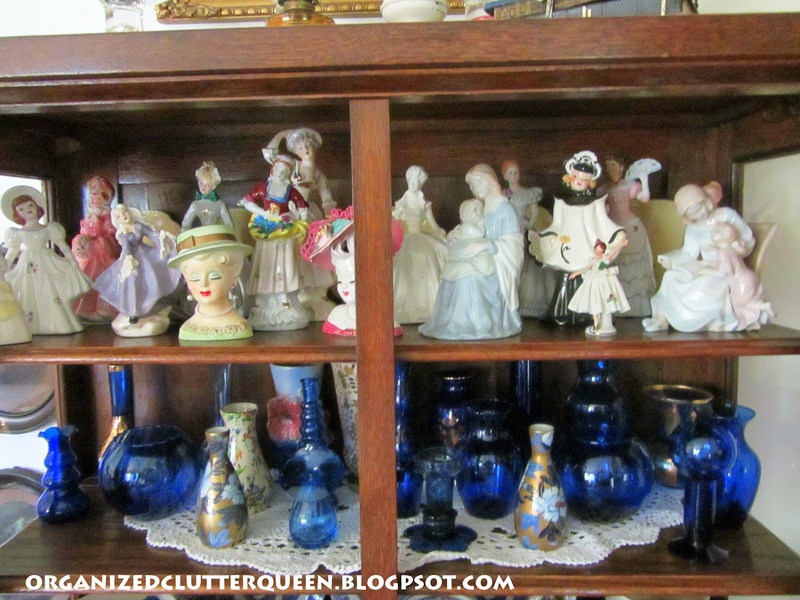 Lady headvases, lady figurines, and cobalt blue vases. 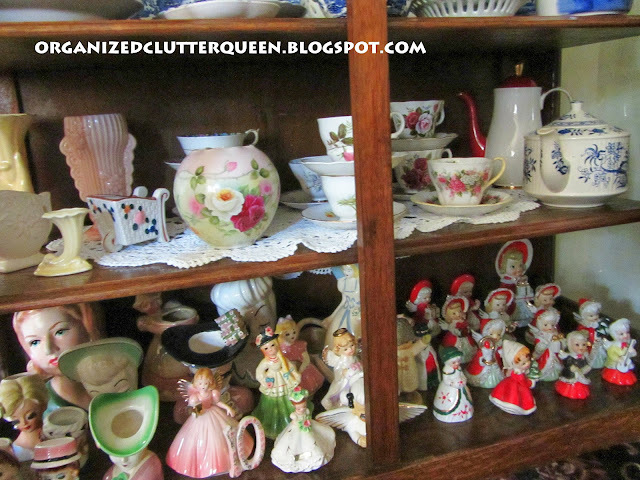 Tea cups, vases, Lefton Christmas angels, more head vases. The china cabinet fits perfectly on this small wall next to my dining table. A very vintage corner indeed! Here's Grandma with my Aunt Vonnie in the 1930's (when times were tough). 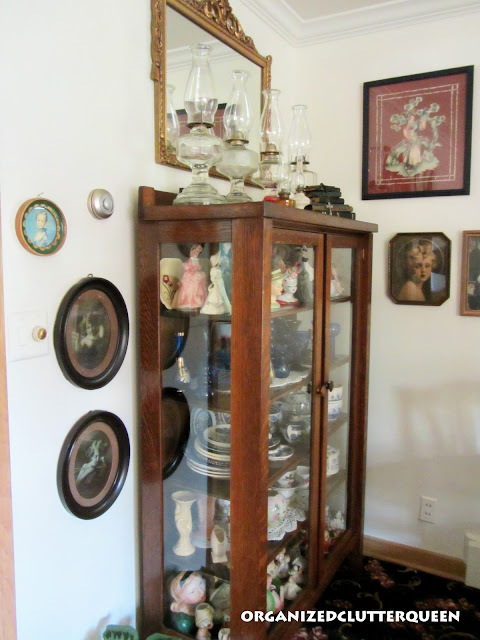 Thanks for stopping by to see my Grandma's China Cabinet! I don't understand why there still aren't glass cupboards being made as it really eliminates the need to dust what's inside. Sometimes I think progress just isn't! The picture of your Grandmother and Aunt is precious. Is that a real log cabin they lived in behind them? So cool! Beautiful! I love Lefton also, and have one or two of the angels. 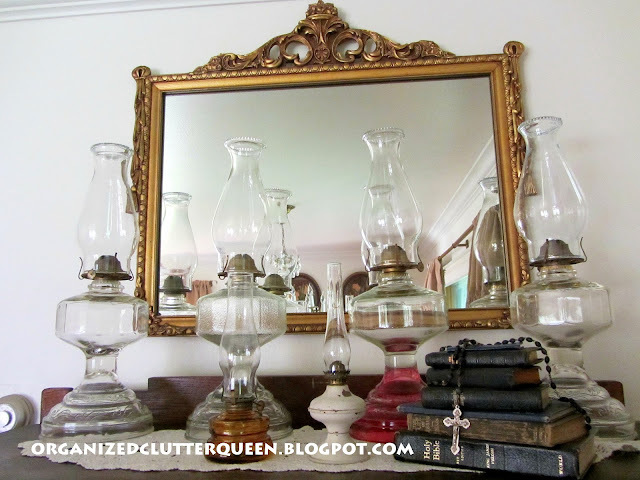 I have a similar mirror-same decorative frame-but mine is round. 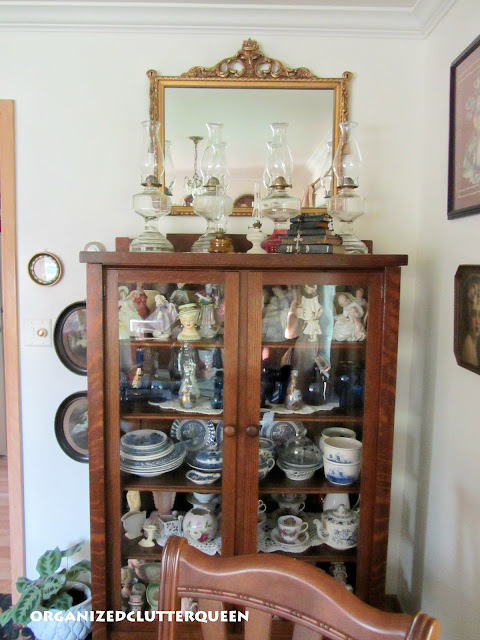 And also a similar curio cabinet with glass on three sides but it is curved. 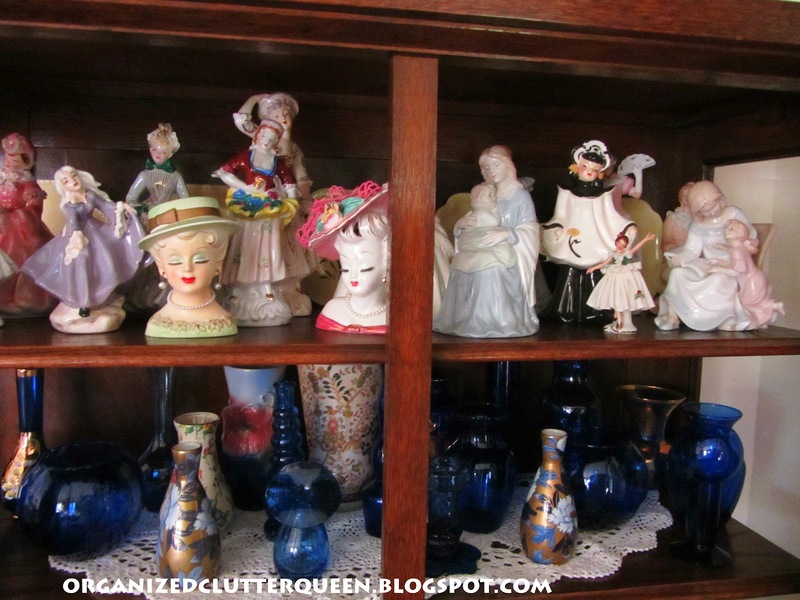 Your cabinet is beautiful and filled with wonderful treasures. Especially, my favorite Lefton angels!! The picturew of your grandma is adorable, she was so pretty...like you! The Lefton and all your treasures agre great! The curio cabinet is gotrgeous and a special piece too. Have a happy week. Love the old photograph! Your cabinet holds so many special things and looks great. I collected oil lamps at one time but do not have them now. I had to come and see your Grandma's cabinet, it looks so similar to one we had in my home growing up that my sister now has in her possession. You have quite a beautiful collection of memories and lovely treasures, but that picture just steals my heart. Love the look on your aunt's face. Too cute! 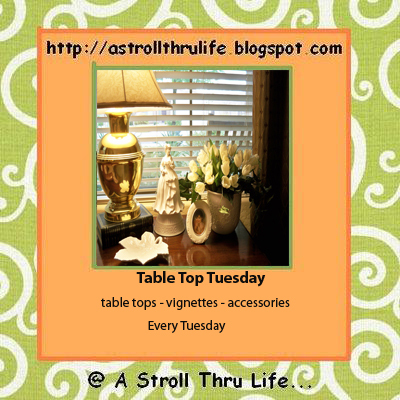 Stop by and see me at Quirky Vistas sometime! Your grandmother's china cabinet is the perfect place to display your collections. Great mirror and photo of your grandmother. Love her outfit. Popping over from The Tablescaper. What a special thing! I love your little stack of bibles!!! There isn't anything more special in a home than items filled with history and personal value!! 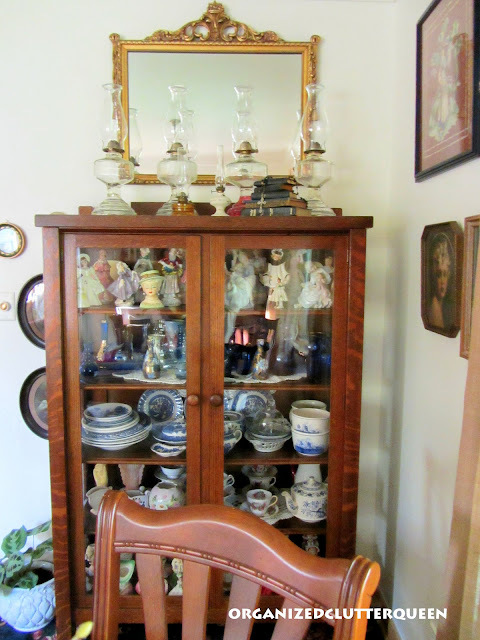 I love your Grandmother's China Cabinet! Can you imagine the parties it has seen! What a wonderful piece of history! I just love your Grandmother's Cabinet and you have it filled with so many pretty treasures! Thank You for sharing with us and I hope you have a wonderful week! Thank you for sharing your Grandmother's cabinet and the collections. There are so many wonderful things in there! 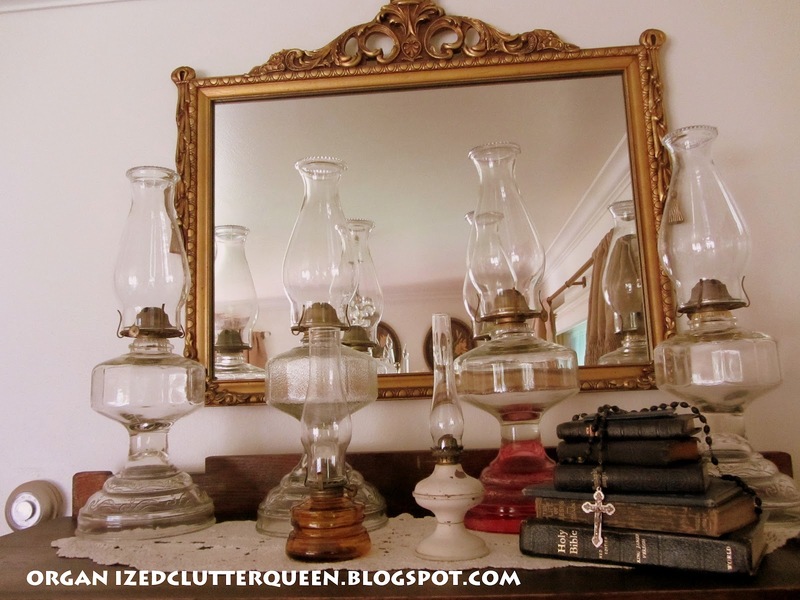 Oh and your oil lamps *swoon* love them! I love the cabinet. Those lady head vases, I collect some of them too. Such sweet treasures. Carlene, Your Grandmother's cupboard is gorgeous. I love everything in it, the mirror above and all the pictures. You and I have very similar tastes. I even have the cupid picture AND the pic to the right with the halo. I've always wondered if this is supposed to be Jesus as a child. Whoops, looks like Im already following. See, I told you I love your taste. Your Grandmothers was a beautiful Lady, LOVE THAT PHOTO!